Get two, one for each hand. A little post… my brother decided to start a music review blog. I think it’s strong writing, so, if anyone runs a magazine or something, check it out. He’s pretty smart, if I do say so myself. Optimism vs. Pessimism I was talking with a long-time friend and all-around amazing person Bert Crenca, and we were at a bar, so bear that in mind, but in talking about all the great stuff happening in Providence right now, he confided in me a great thought: he felt like he died and went to heaven. He is dead now, and this is it, this is heaven. And that made me think, yeah, it IS pretty damn good here right now. We’ve got some many great things happening and so many great collectives doing cool stuff. This may be the time that people look back wistfully upon when things aren’t so good anymore. I don’t know when that will be, but maybe someday it won’t be this good. So if we are all dead and in heaven, then let’s hope we don’t get kicked out anytime soon and sent to hell. I recently posted a whole slew of photos from Otis College of Art’s 2007 Senior Show last week – just the Fine Art department. I have been going through and adding names to the works, but still have some to add. So, they are not all attributed yet. But go take a look, lots of good stuff there. I keep meaning to post this…a tiny review of my recent work has been written by Jason Hill on Uber. I found out about a sweet new project by my favorite architecture firm, OMA, yesterday – the Ras al Khaimah Convention and Exhibition Centre in Dubai. Twas linked on Coudal of course. Seems they are tired of the competing radical formalism of contemporary skycrapers, and decided to take it back to basics in order to create a form that stands out in the crowd. And by basics, there are talking ideal form. Sphere. Rectangle. 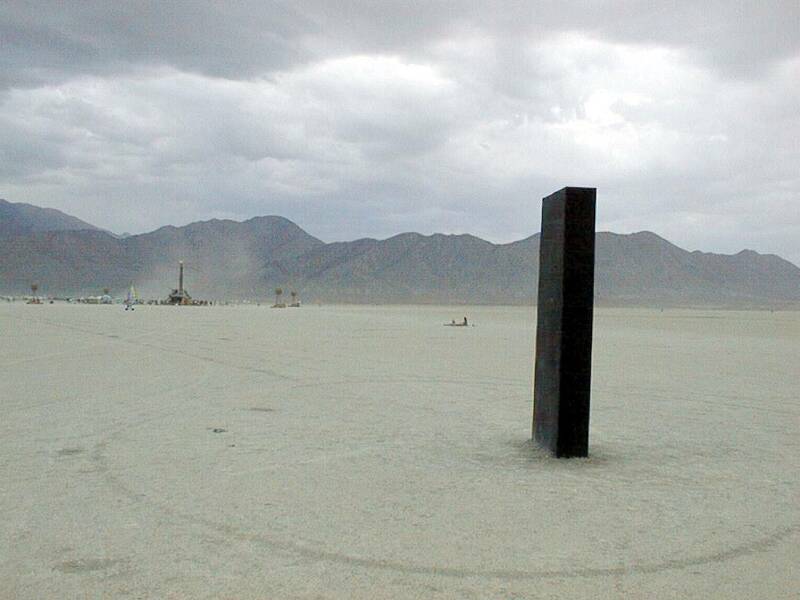 A natural form and a man made form. Or is it a weaponized moon, and an alien placed form? Of course there is some precedent for this in architectural history, Boulee experimented with the ideal form of the sphere in his drawings, as did Ledoux. There was Buckminster Fuller at Disney’s Epcot, one of the many places he erected a sphere. But, more important to Koolhaas and OMA, there was the Trylon and Perisphere at the New York World’s fair back in 1939. He has written extensively about these as part of his “retroactive manifesto for New York”, Delirious New York. One thing you can be certain of, OMA has anticipated all of these comparisons and references, as well as some others I am sure. They do have a sense of humor over there, and that is part of what makes their work so great. Check out their project page here. For another little write-up on the project, go here. From xkcd, one of my every-other-daily reads. 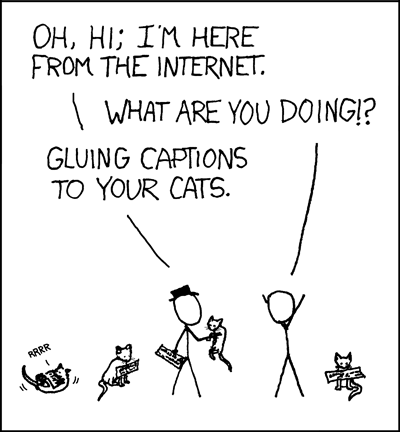 If you are not familiar with teh LOLCAT phenomenon, then the genius of this comic will escape you. MoxieE’s flickr page has some photos from the fire at Griffith Park the other day. I am so used to the fires happening out in the wilderness or deep in the valley where I rarely venture that it was shocking to see part of the city I know burning up. For those out east, Griffith is kind of like our central park, only off to the side and up a hill instead of in the middle of the city. Houses come right up to it, it is always full of hikers and people on picnics (is that spelled wrong or something?) and is home to the Observatory, the Zoo, and the Greek theater. Guy with hardboiled eggs: Hey, you got your nasty, sticky pink fluid on my eggs! Guy with nasty, sticky, pink fluid: Hey, you got your hardboiled eggs in my nasty, sticky, pink fluid! Both together: Lets eat it! And we can call it Eggs A’la Kang! Oh, Mr. Lion, I finally found those hunting stilts you needed. Get ’em on before the giraffes get their skates in the mail.